Choosing a wedding ring might be a style change for some men, especially if he isn’t used to wearing a ring—or any jewelry! 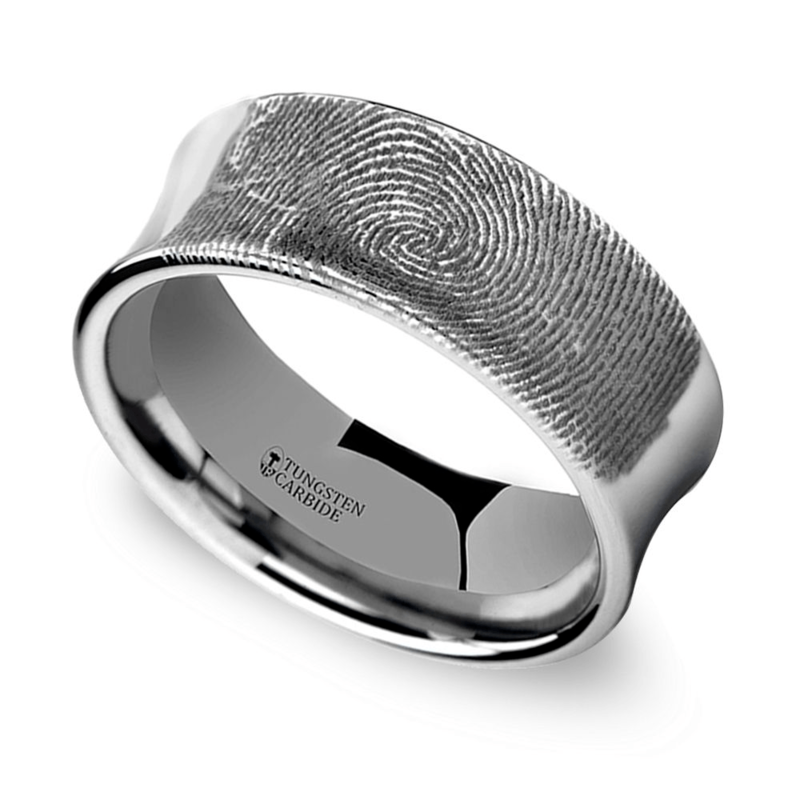 While a plain band remains a traditional and easy choice, there are so many options for men’s wedding rings. And even if he doesn’t find one that he loves from a stock collection, there is always the option to design a custom ring. Wedding—and engagement!—rings remain incredibly personal for the wearer. These are pieces that will be worn for a lifetime, so the ring’s design should be both unique and versatile. The ring should be a reflection of the wearer, and he should choose a ring that suits his style and personality. And a custom men’s ring design ensures he gets what he wants! Adding an inlay to a plain band adds immediate visual interest. An inlay is a band of material set within the center of the ring. The material for the inlay can be almost anything—from a contrasting metal to dinosaur bone (yes, he can have a dinosaur bone in his ring). Inlays can also be used to accent gemstones or diamonds. 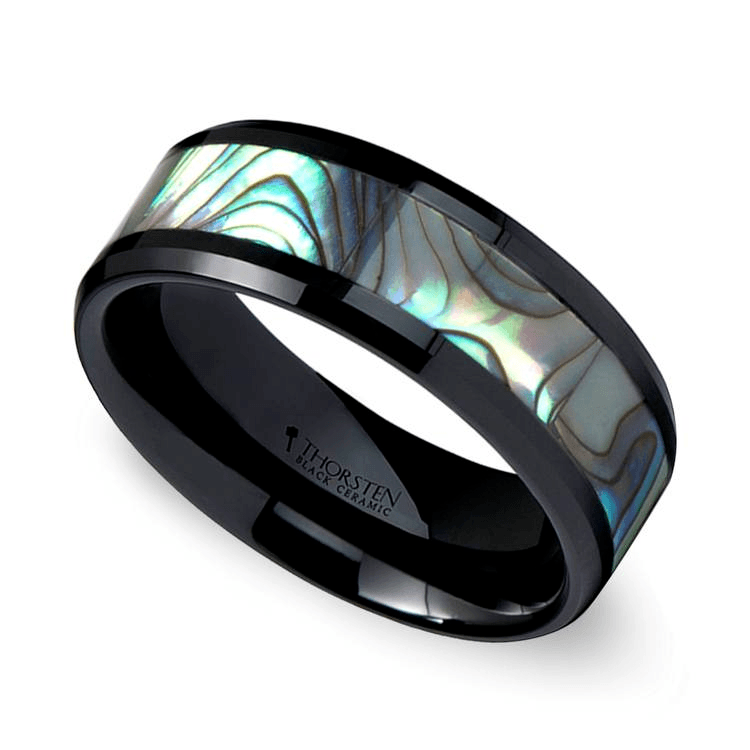 For a pop of color within the band, use an inlay like abalone shell or opal. A shell inlay is a great choice for surfers or anyone who loves the ocean! Opal inlays can be chosen in a variety of colors including bright red and blue-green. 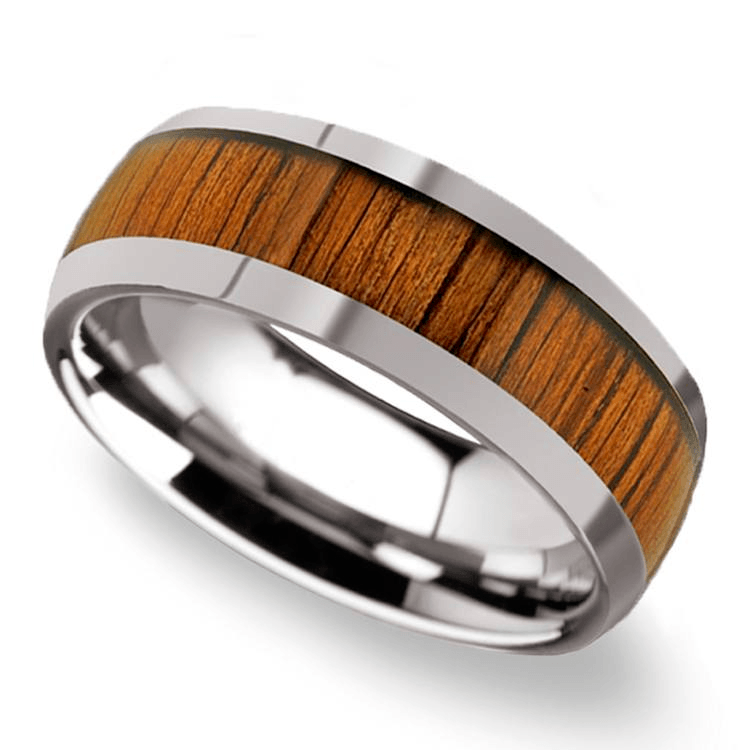 Wood inlays reflect a casual laid back personality, and there are many wood varieties that can be integrated within a ring. Koa is native to Hawaii, and is ideal for surfers and oak is known for its strength. For an unexpected accent, inlays can also be crafted from extraordinary materials. 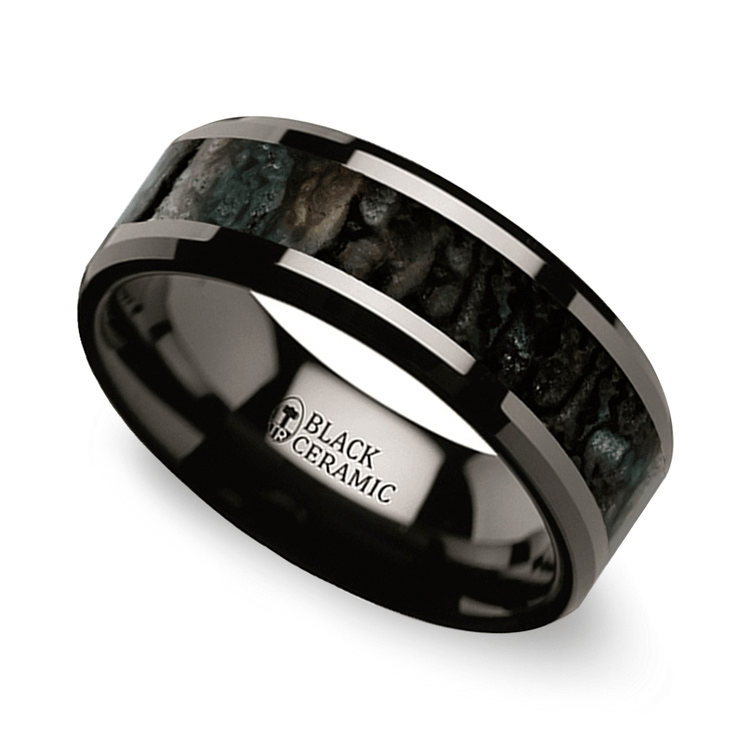 Dinosaur bone and meteorite (taken from the Gibeon Meteorite) turn a ring into an immediate conversation piece! Design the ring around these details that were millions (or billions!) of years in the making for a one-of-a-kind custom creation! The easiest way to paint color into a ring design is by incorporating gemstones. Tiny (or big) accent stones give life to any design. Use colored gemstones or diamonds to paint pictures on his band, to border engraved designs or just to draw interest to his finger. Gemstones and diamonds also can be used to create intricate patterns within a ring or to showcase your union using your birthstones. Metals have been carved or engraved for thousands of years. 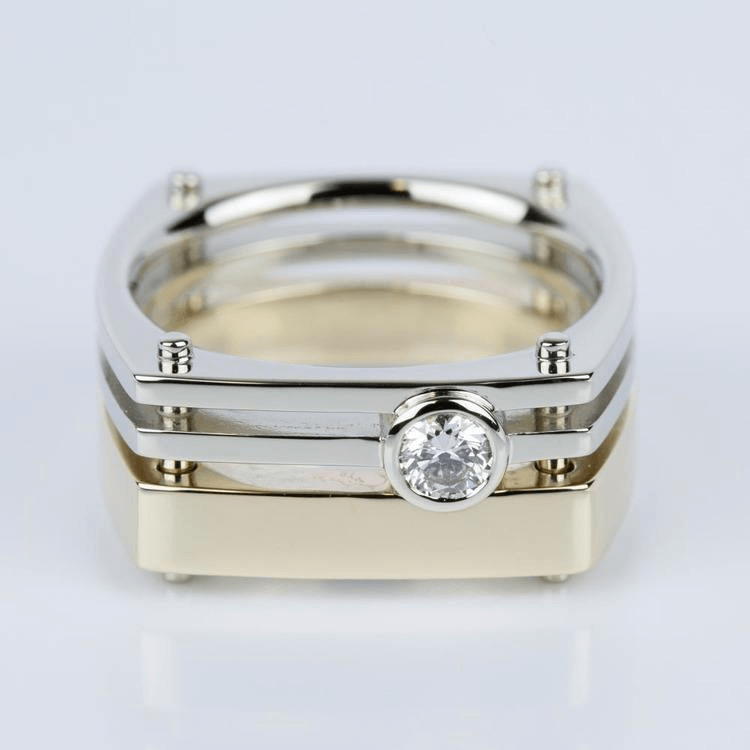 Whether he chooses platinum, gold, cobalt, or zirconium, his band can be designed with details carved within the ring. Some materials also can be laser engraved for custom designs. Whether he wants a city skyline, Celtic knots, or maybe even a rendering of his Scottish tartan, his ring will wow him with precise details! Use gemstones or diamonds to add details to the etchings for a design painted with precious jewels. His wedding band shouldn’t be the only custom design. If you’re planning to propose, create a unique engagement ring that emphasizes what you love most about him. Choose the perfect diamond shape, and don’t be afraid to go bold and unusual by selecting a kite-shaped or a shield-shaped diamond. Build and design the ring around the diamond centerpiece and add details that reflect his style. Incorporate his birthstone or yours (or both!) or play with shapes and geometric proportions. You can even mix metals (literally with a Mokune Gane style) or just embrace simplicity with a simple solitaire. Before committing to a design, play around with ideas and pull inspiration from his style. If he’s not a diamond lover, opt for a gemstone engagement ring. 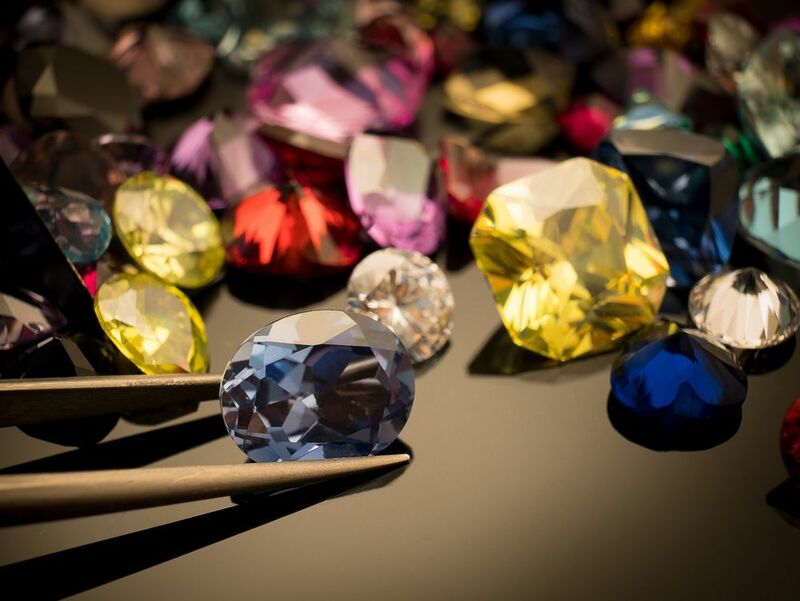 Select a gem in his favorite color… or, again, choose his birthstone. Cabochon cut stones look sleek and amazing in men’s solitaire rings; a gemstone cabochon is polished into a spherical design, and it is extremely regal. When the perfect ring just can’t be found in-store or online, create a customized masterpiece! Use inlays, gemstones, etchings and your creativity… and design his dream ring with Brilliance!